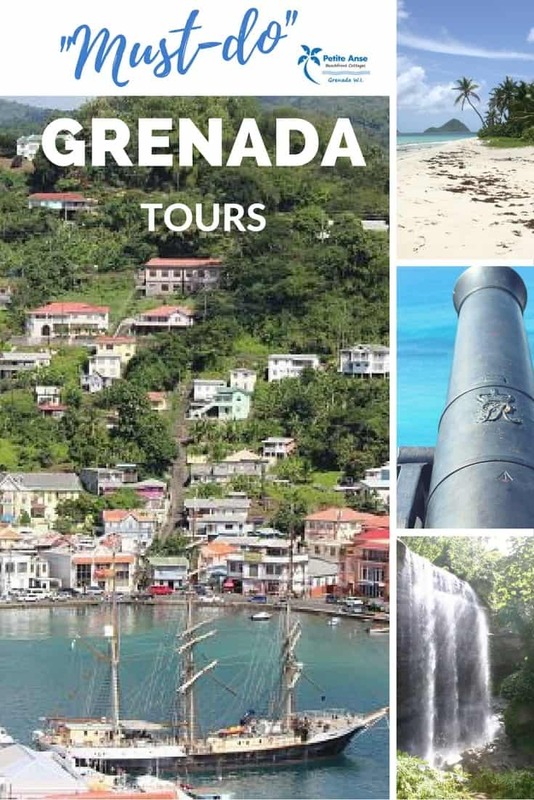 Our Grenada tours offer much when it comes to beautiful sites to see and memorable and historic places to visit. We’ve picked out the cream of the crop so that you don’t miss out on the most fascinating and interesting spots to see. Every one of our tours has been designed to ensure that you discover the most enchanting and intriguing sites of the country. We focus mainly on the north coast area, although we do venture south in our tropical adventures. Our tour guide, Richie, has extensive knowledge of the island and will give you the lowdown on every location that you visit. You can also create your own bespoke tour. 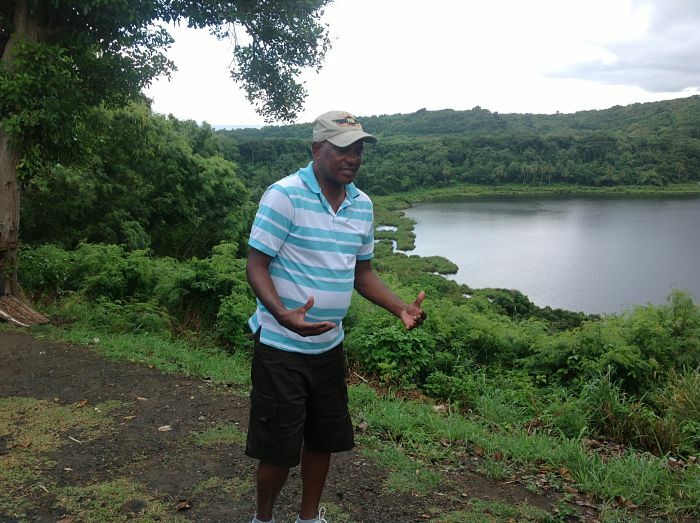 Ritchie, our Grenada tours guide. Leapers Hill – an important historic site of pre-Columbian times. Visit the spot where over 40 Kalinago (the original peoples of Grenada) threw themselves over a cliff. They wanted to avoid being subjected to the cruelty of the French who were set on ridding the island of the indiginous peoples. River Sallee Boiling Spring – located in the River Sallee area are 6 boiling springs with a water temperature of 35 degrees centigrade. The spring are found within 594 square meters of land where the surface is composed of soft porous volcanic sediments. The largest hole, which contains muddy brown water, is 5 meters in circumference and about 2 meters deep. The other, smaller holes are filled with clear, salty water and more than a mile from the sea. Orange – yellow sulphur deposits occure in the runoff channels. 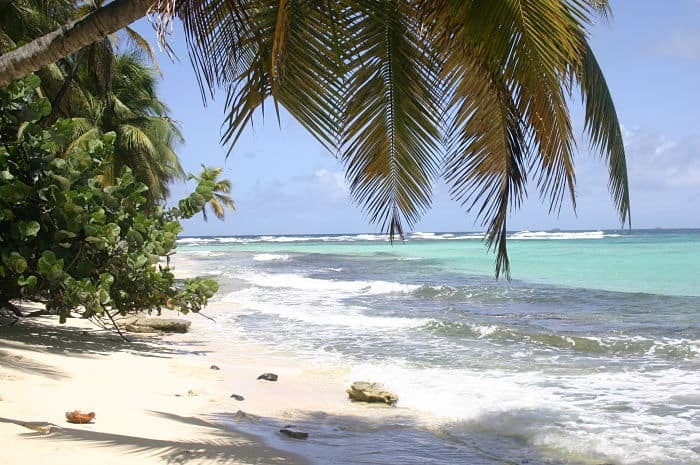 Bathway Beach – a beautiful beach that is often enjoyed by local people. Worth a visit. Please note that although there is some protection afforded by the rocks, this is the Atlantic Ocean, so it can be powerful. Lake Antoine – you should see some local birdlife on the shores of this 6 hectare crater lake. You may also see watermelon, papaya, dasheen and bananas growing on the neighbouring farmland. Look out for Antoine Beach where the Atlantic waves roll in. River Antoine Rum Distillers – The Estate produces Rivers Royal Grenadian White Rum based on 18th Century technology. The rum distillery is over 100 years old and uses water as it’s energy source, it is the only one of it’s kind operational in the Caribbean. Belmont Estate – an old estate built in 1600s which now houses a restaurant that offers local cuisine, a museum and their petting, flower and organic farms. Also the goat dairy that produces goat’s cheese. Carib Stone – stop off at Mt Rich to view the Amerindian petroglyphs or drawings that may depict myths. Bathway Beach with it’s Atlantic Ocean waves. Leapers Hill – an important historic site of pre-Columbian times. This is the spot where over 40 Kalinago (the original peoples of Grenada) threw themselves over a cliff rather than be subjected to the cruelty of the French who were set on ridding the island of the idiginous peoples. River Sallee Boiling Spring – located in the River Sallee area are 6 boiling springs with a wter temperature of 35 degrees centigrade. They are found withing 594 square meters of land where the surface is composed of soft porous volcanic sediments. The largest hole, which contains muddy brown water, is 5 meters in circumference and about 2 meters deep. The other, smaller holes are filled with clear, salty water and this more than a mile from the sea. orange – yellow sulphur deposits occure in the runoff channels. 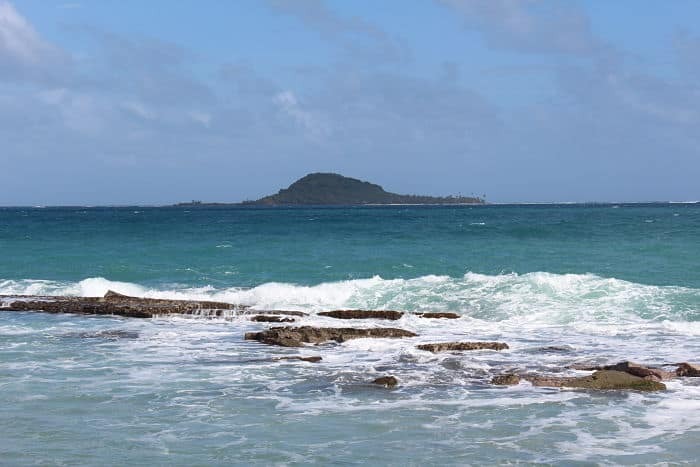 Bathway Beach – a beautiful beach that is often enjoyed by local people. Worth a visit. Please note that this is the Atlantic Ocean, so it can be powerful. Lake Antoine – you should see some local birdlife on the shores of this 6 hectare crater lake. You may also see watermelon, papaya, dasheen and bananas growing on the neighbouring farmland. Look out for Antoine Beach where the Atlantic rolls in. Pearls Airport – when the US military invaded Grenada back in 1983, Pearls was one of their primary targets. Old planes, like this Soviet crop duster with “CCCP” still barely visible on the fuselage evidence the Cold Ware history here. This aircraft, and an old Cubana Airlines plane nearby, were both damaged by invading US forces and left here to rot. Visitos can explore both aircraft inside and out, though you’ll want to watch out for the cows and goats, and their attendant dung patties. Grenville Market – a chance to pick up some souvenirs to remind yourself of your stay in Grenada, or for friends and family back home. 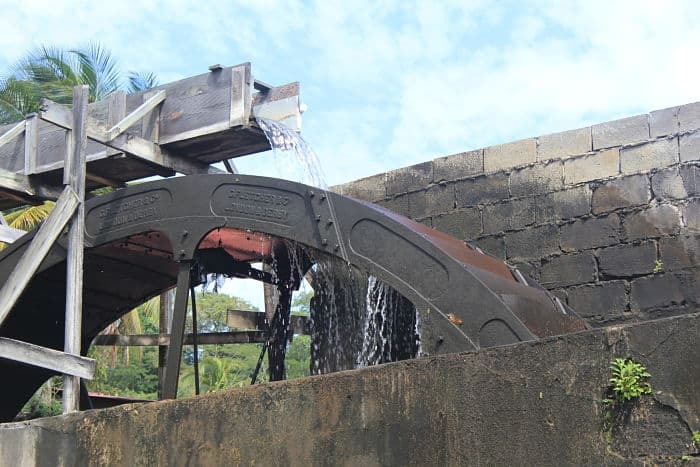 The River Antoine Rum Factory waterwheel operates in the rum making process that’s been the same for the last 200 years. 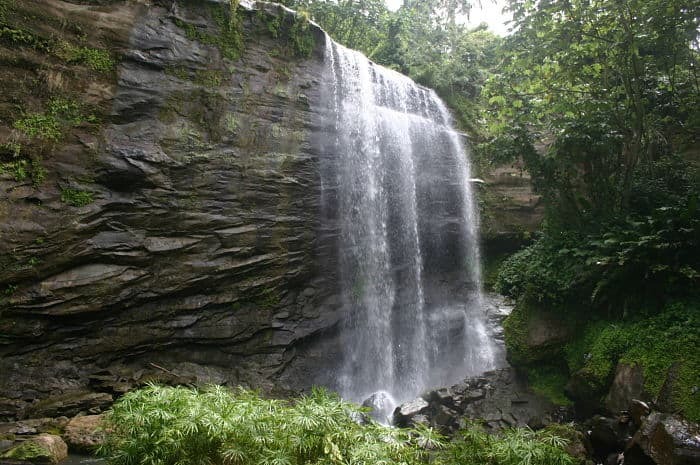 Mt Carmel Waterfall – a short trail walk leads to a beautiful wide waterfall that tumbles down a flat rock from the Marquis River. Mt Carmel Waterfall is accessible via a short trail. Grand Etang – Established in 1992, the 1000 hectare national park is home to the mona monkey and the gommier tree (used by Amerindians to build canoes from). There is a visitor centre at the crater lake to learn more about the multitude of habitats, flora and fauna of the location. Annandale Fall –you may see a mona monkey when you visit the pretty Annandale Fall which is a cascading waterfall. Fort Frederick – this well preserved West Indian fortification is worth visiting. 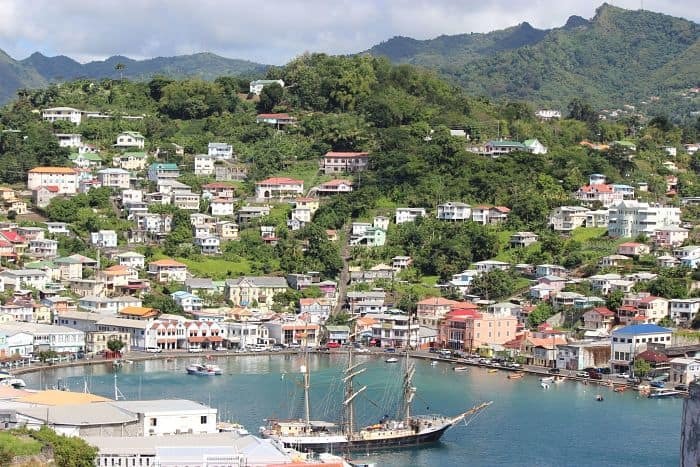 Town of St George – often referred to as one of the prettiest towns in the Caribbean, St Georges is built around a large natural harbour. The capital of the country has a wide variety of small shops and boutiques to browse. 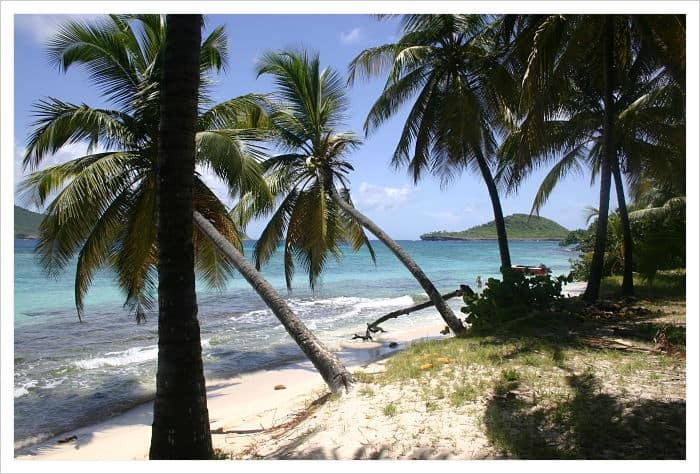 Grand Anse – the signature beach of Grenada and home to several luxury and high end hotels. Contact us today to arrange your Grenada tours.